Close your eyes and remember your breakfast. How did it feel? Was it slimy scrambled eggs? Was it crunchy cereal? Or, like the man after which Richard E. Cytowic’s non-fiction book The Man Who Tasted Shapes is titled, did it feel pointy in your hands from the pepper? Was this last question confusing? That’s because it’s a sensation someone with synesthesia might feel. Synesthesia is a neurological phenomenon in which one sense or thought consistently leads to an experience in another sense or thought. From the example above, someone might taste pepper and feel points in their hands, like they were holding a spiky ball. Or they might always see the number 9 in red. This is a graphical representation of what synesthesia is like for some people. Someone with grapheme-color synesthesia sees letters and numbers as certain colors, even if they are printed in black. When tested multiple times over the course of years, people with this type of synesthesia will see each letter or number as the same color they did the first time they were tested. There are many kinds of synesthesia, and every person’s experience is different. Broadly, there are projective synesthesia and associative synesthesia. Projective synesthesia is when someone literally sees a color or shape, feels an object, or hears something that is not there in response to a stimulus. Associative synesthesia is when someone associates the stimulus very strongly with a color or shape or sound or even a concept, but does not literally experience it. Someone with projective synesthesia might see letters and numbers as different colors (grapheme-color synesthesia; see figure above), while someone with associative synesthesia might strongly feel that the number 6 is extremely shy and cannot be near the overbearing 7. Someone with projective synesthesia might see colors and shapes when they listen to music, but someone with associative synesthesia might associate colors with music or different sounds (chromesthesia). Synesthesia is also automatic, meaning it happens immediately when someone is exposed to a sense and without their control. When neuropsychologists test for synesthesia, they include tests that require quick reactions. For example, in a field of “5”s are scattered a few “2”s and the testee is given the task of identifying all the “2”s. Most people would take a bit of time to complete this task, as the numbers are presented to appear as similar as possible, but someone with grapheme-color synesthesia would find it easy. Instead of a sea of black numbers, they would see all the “5”s in one color and the “2”s in another, even though they hadn’t consciously identified each number yet. To check out this test, look below. This image demonstrates the automaticity of synesthesia. 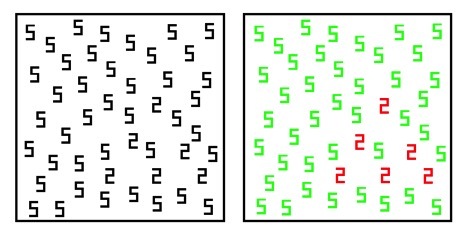 A person being evaluated for synesthesia is given the image on the left and told to identify the “2”s as quickly as possible. If they have grapheme-color synesthesia, the image with appear more like the one on the right, and they will be able to complete the task much more rapidly than someone without that type of synesthesia. Image by Edward M. Hubbard, first appearing in Ramachandran and Hubbard 2001, shared by the author under the Creative Commons Licences. Neurons are the brain cells responsible for receiving and processing sensory input and directing motor output. As they develop, they make connections with each other called synapses. These connections allow them to talk to each other, to tell each other to do things (activate) or not do things (inhibit). In a process called synaptic plasticity, synapses that aren’t used enough get pruned, while synapses that are used a lot get strengthened. The cross-activation hypothesis of synesthesia states that in most people, the connections formed between different senses are pruned early in life. In people with synesthesia, this pruning is incomplete, allowing for one sense to trigger another. The disinhibition theory of synesthesia is a little less direct. When a sense is triggered, a signal is sent to a region of the brain that can process it, then an association area of the brain that can interpret it. For example, an image will be processed for you to understand that certain shapes and colors are present. Then the image is sent to another part of your brain so you can use the information in the image, to read a book or navigate your messy room. Normally, any signal sent back to the processing region of the brain is inhibited. The disinhibition hypothesis states that in people with synesthesia, this signal feedback is disinhibited, and the feedback goes to another sense. If you think you have synesthesia, or want to know more because synesthesia is really cool, visit https://www.synesthesiatest.org/, check out one of Richard E. Cytowic’s books The Man Who Tasted Shapes or Wednesday Is Indigo Blue (with David M. Eagleman), or read the novel A Mango-Shaped Space by Wendy Mass (warning: it’s a tear-jerker).